In March I was sent a link by a friend to a French tent/shelter cottage manufacturer. I was looking for a compact, lightweight simple one man shelter. Tipik make a number of tipi style shelters as well as some flat tarps and the Pioulou, an innovative one person, single skin, semi pyramid shelter. After seeing the Pioulou on Tipik’s web site I started searching for reviews, pictures and any information I could find. It turned out that only one other person had one somewhere in Europe and they had only written a small review. I contacted Xavier at Tipik and started firing questions off about the shelter, custom options that were available and he was happy to help. Xavier sent me over some pictures, fabric options and information about other questions I had. On the 15th of March 2018, I decided to go ahead and ordered a custom version of the Pioulou, Some of the options I chose were to have 20D Silpoly in Foliage, Lineloc3’s all round and on the doors I asked for quick release linelocs. The lead times are very clear on the web site and mine arrived on the 24th May exactly when I was advised it would. As you can see form the pictures above, the shelter packed away is pretty small the out of the box weight was 354g. The stuff sack is made from the same Silpoly as the fly and finished very well. The first pitch only took a few minutes, I am used to this style of shelter and it was very simple to setup and get taut. You need 7 pegs minimum, for this pitch I had used 9, Four 8″ Eastons for the main corners and some ground hogs to make up the rest. Pole height is variable as with most trekking pole shelters. 20D Silpoly in RSBTR Foliage, fairly slippery to touch and is soft as silk. Good cross of ripstop every 5th of an inch. The material feels fairly fragile at first but once pitched and you tighten the lines it obviously very strong with a little stretch but not anywhere near what I am use to with MLD Silnylon. I’m very pleased with the colour I chose, to the eye in most light it looks like a greyish green and is very discrete. At night and in the morning it lit up very nicely, letting just enough light though but weirdly did’nt seem to trap heat like my other shelters. The stitching looks very good. I had a look over each seam last night whist pitched and could not see any pulls, strain, stretching or miss-stitching. All the stitching looks very well finished too. The corner and door tieouts as well as the rear mid panel point have what looks to be hybrid dyneema patches glued in place, the corner and door reinforcements are also sewn around the hem. As standard the tarp will come with either a ladder lock or a simple loop on the corners, back midpoint and one of the doors with a quick release lineloc3 on the other door. I chose to have linleoc 3’s on all points and both doors to have the quick release version. I have put 2.3ft lines one the corners and 1.7ft line on the rear midpoint, having the linelocs was a godsend last night as there was stone underground everywhere I tried to place a peg. IMO, the linelocs and longer lines give more option for pitch location ad height. The apex also has hybrid cuben in a cone, I used half a tennis ball in addition to my pole bung for reassurance, I do this with most shelter when the pole tip / bung end is used. The shelter came with a pitching guide which I ignored and found my own way. The website and guide state that a pole height of 125cm would be best. This is correct but leaves very little ventilation gap, I much prefer having at least on end of a shelter raised for a flow of air. When I got home I measured the pole height I used last night and it was 137cm. With the pole bold upright you’d get around 5-6 inch gapes from the floor all-round. I angled my pole approx 3 inches off centre towards the door which allowed me to peg the rear down a little closer but maintain an air flow and have the front/door around 6 inches clear. I have only pitched the shelter five times and can have it up in under 4 minutes now, 7 minutes if you include the mesh inner I used last night. As you can see form the pictures, there is more than enough space for me to simply lay down, use an inner or bathtub. I have an Oookworks bathtub 220×70 and 3FUL inner seen in the pics which both fit without issue. I am get to try my Duomid Oooknest but seeing as its technically the same dimensions as the 3F inner it should fit without issue. To give you a better indication of space. The 3F inner is 220×70, I was using a Thermarest Xlite Regular and an Exped pillow. In he picture where I am laying inside the inner my feet were approx half a foot from touching the end of the inner with my knees slightly bent. With the inner in place and the doors closed, there was nearly 2 feet from the door overhand to the inner, tapering off to the corners but ample room to store my pack, shoes, water, poles and cook without restricting entry/exit. I’ve used the shelter for five nights so far and have enjoyed every one of them. The interior space is allot bigger than you’d think with plenty of head room even whilst laying on a 3″ pad. 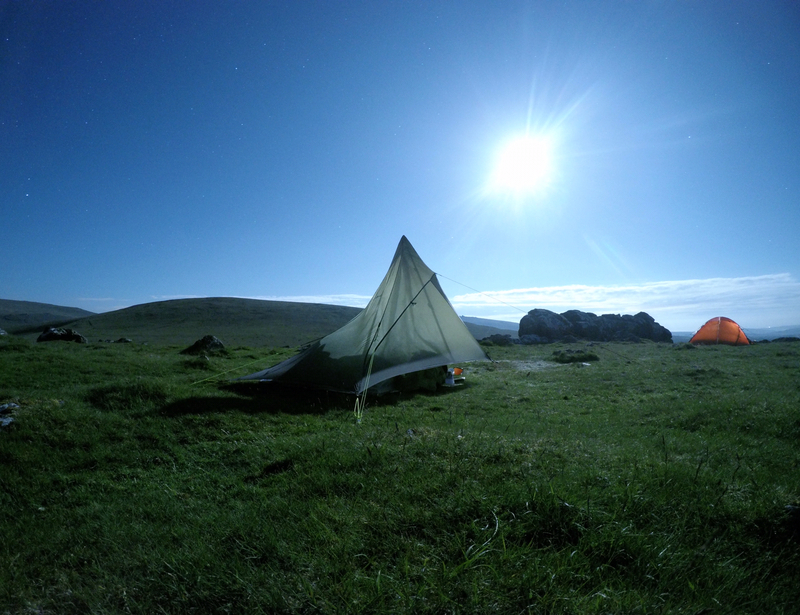 On two nights I had rain and one night some medium wind, somewhere around 25-30mph. So far, I have only found one thing that bugs me, when the door is rolled back, there is only one point the secure the rolled door, thawing was changing direction a lot last night and with the door open the lower part of unrolled and became very flappy. I have sorted this, adding another loop further down the seam, most likely where the additional corner line is secured and then re-seam the seam. I have swapped out most of the lines, it came supplied with 1 and 2mm dyneema line. The 2mm has been swapped out for 3mm and I’ve shortened a few lines. On five of the lines there were slide locks, I am not a great fan of these so I have removed them and used a taut line hitch instead. I have added a second tieback to each door to stop the door flapping in the wind. I have probably missed loads of things that people would like to know, please ask away and I’ll do my best to answer. I’ll update this post with anything of interest but I can honestly say I really like this shelter and would recommend it to anyone looking for a lightweight compact setup. Hi there, great reviews. I’m considering a new ul shelter with a smaller footprint than my Trailstars and Duomid xl for an upcoming Pyranean trek. I’ve got the Hexamid which for my height, 6’2″, is too small for comfort. Both the Tipik and cricket look perfect. Any preferences/ opinions now that you’ve tried both? Hi Rob, in all fairness either shelter should work for you. The Pioulou is longer internally but at 6ft2″ you should not have any issues with the Cricket. Both shelters pitch in a similar time and provide similar coverage. The Pioulou obviously fully closes up which may be preferable to some people.